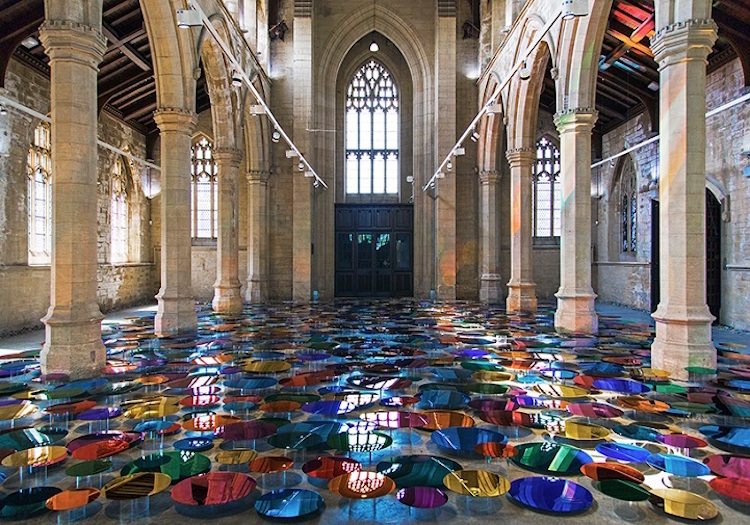 Whether site-specific or designed with any venue in mind, installation art has the ability to transform its surroundings and invite viewers to observe art from new perspectives. 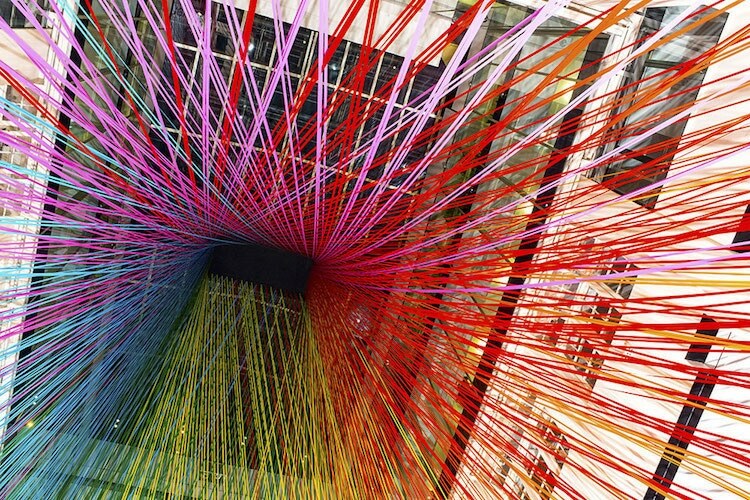 In addition to size and material, installation artists love to experiment with color. 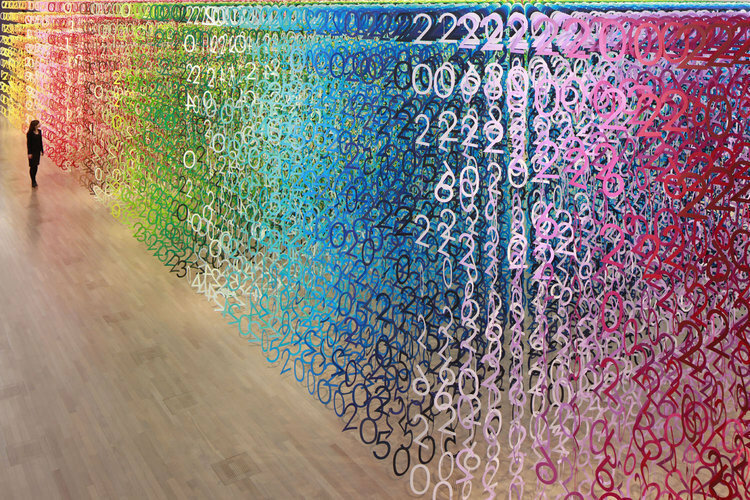 One tonal trend that has taken the art world by storm is the use of a polychromatic color palette, as evident in this selection of artists renowned for their rainbow art installations. 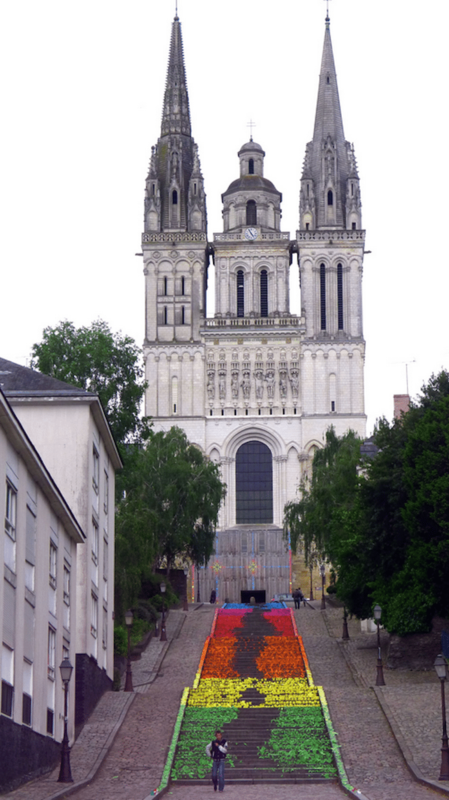 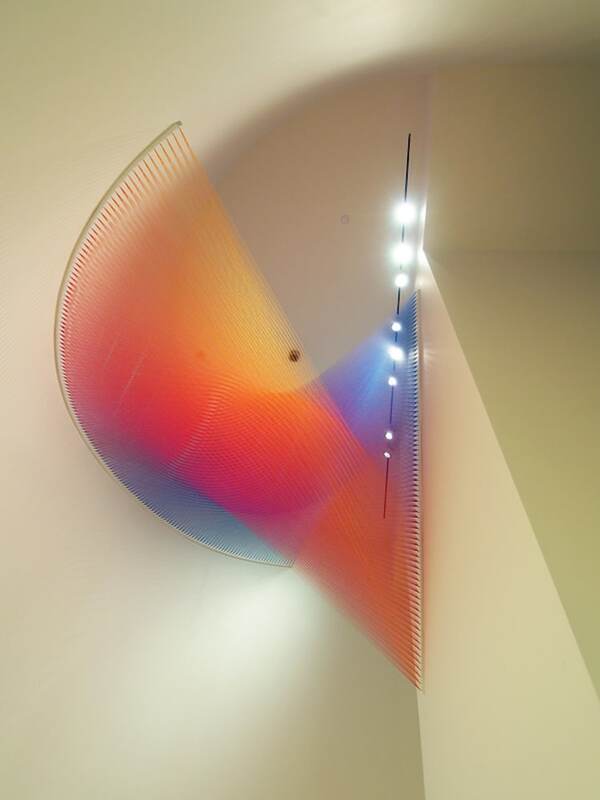 Like most forms of artistic expression, installed works can be found in numerous settings. 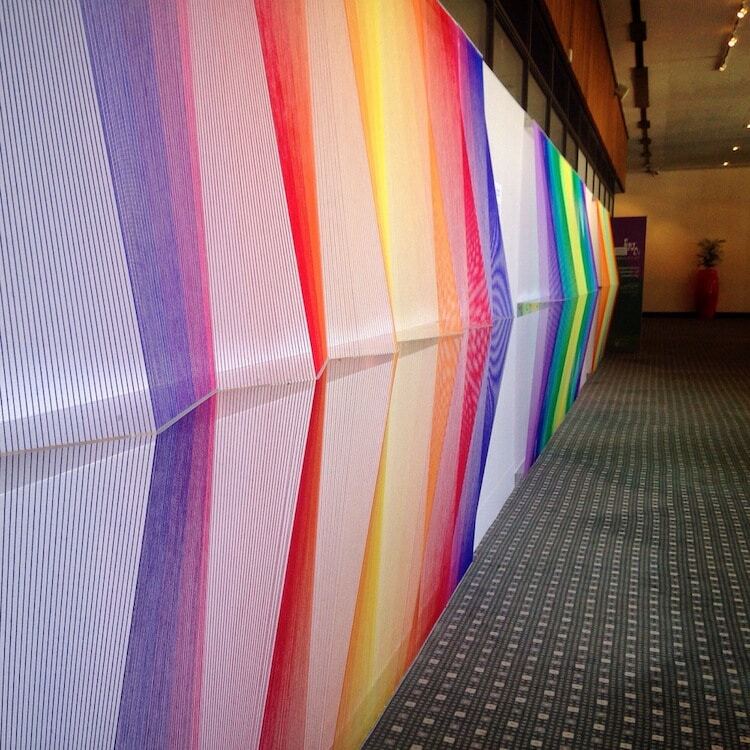 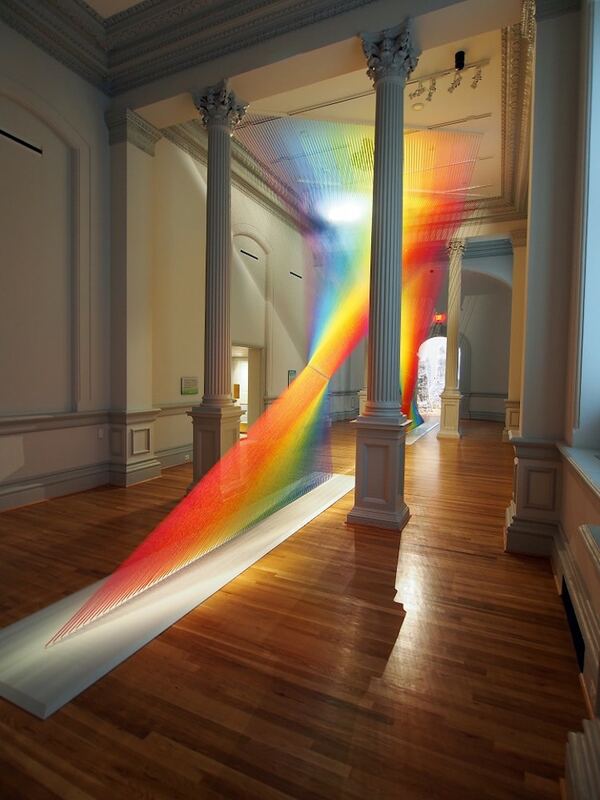 Some, like the ethereal thread exhibits of Gabriel Dawe, migrate between museums. 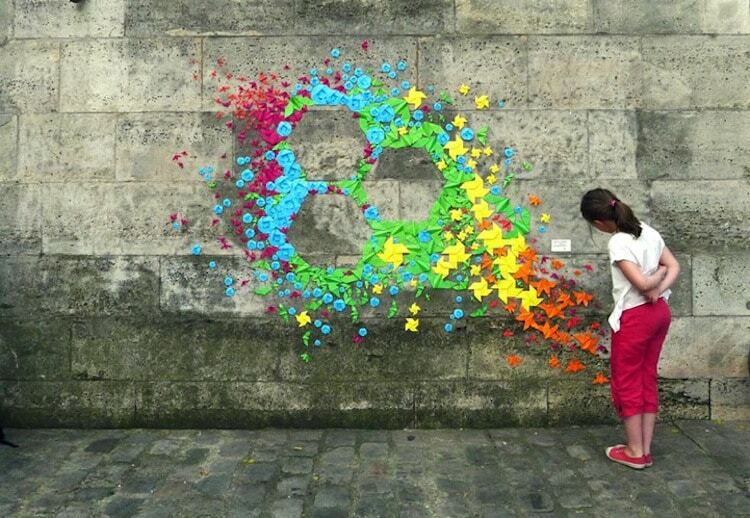 Others, like the paper art creations of Mademoiselle Maurice, bring pops of color to city streets. 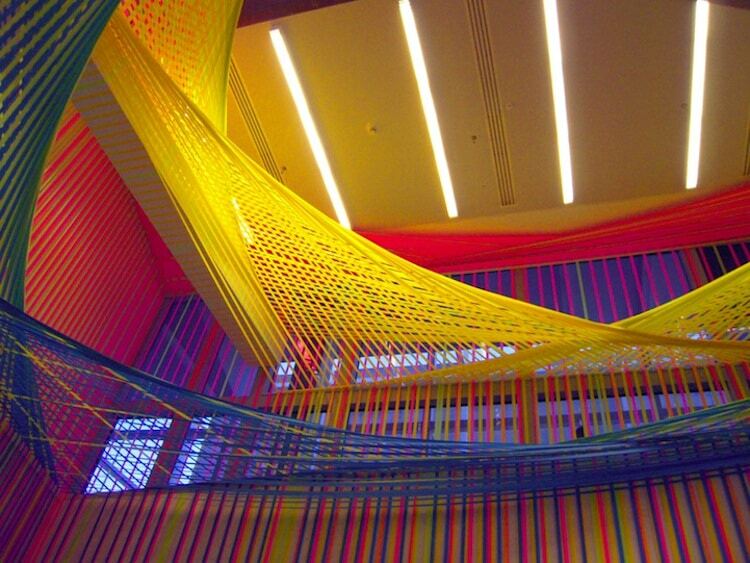 Most, however, are custom-made for gallery spaces and bring kaleidoscopic colors to the often monochromatic settings. 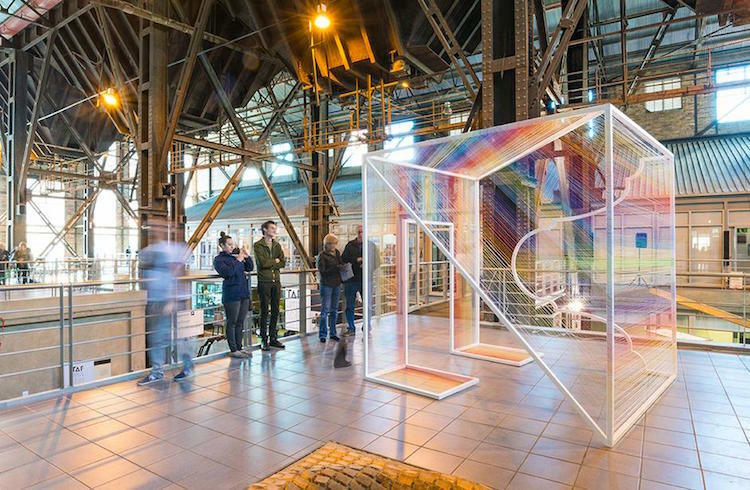 No matter the locale, these artists’ rainbow art installations are sure to dazzle viewers with their dreamy color compositions. 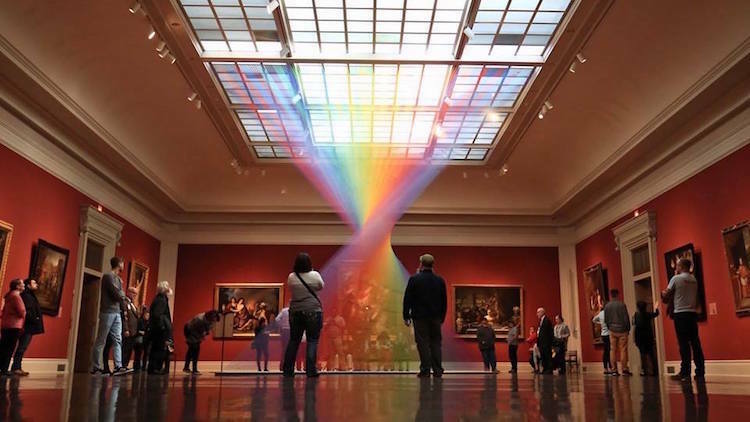 Texas-based artist Gabriel Dawe is renowned for his site-specific installations composed of twisting and turning Technicolor thread. 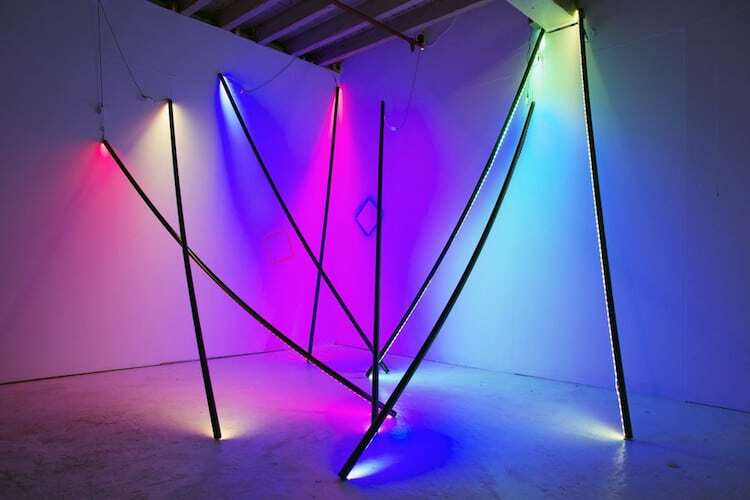 Large-scale and seemingly shape-shifting, his pieces can add a pop of spectral color to any setting. 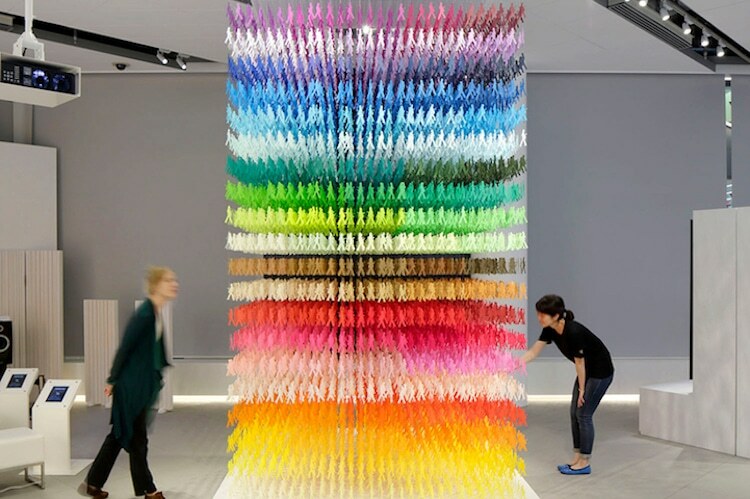 French artist Mademoiselle Maurice installs colorful and ephemeral origami works throughout the world’s major cities. 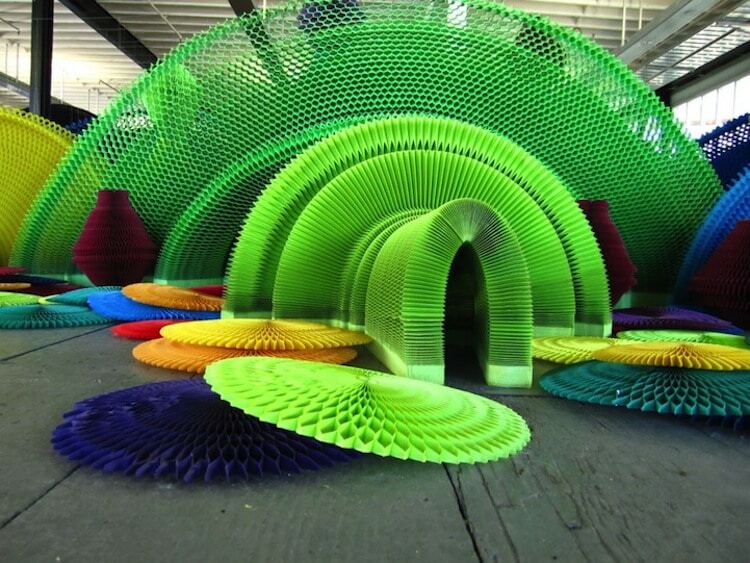 With each piece of bright and bold public art, she aims to embellish ordinary streets and mundane buildings. 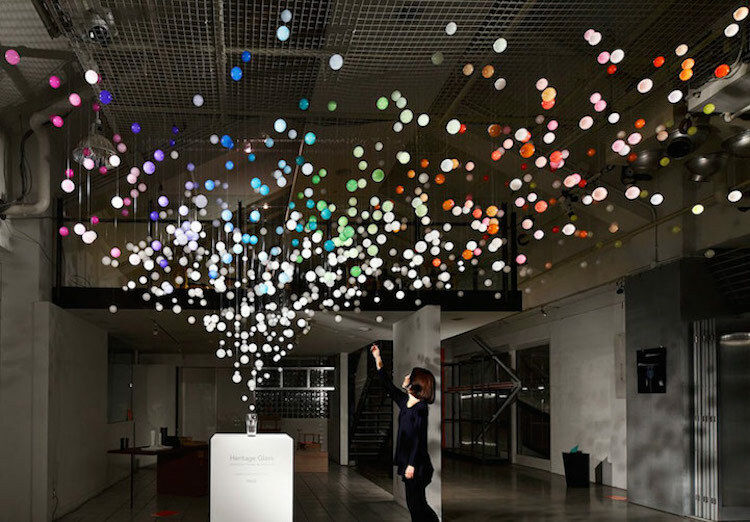 For her ongoing 100 Colors series, French architect and designer Emmanuelle Moureaux creates polychromatic, interactive exhibitions based on a 100-tone palette and a large-scale aesthetic. 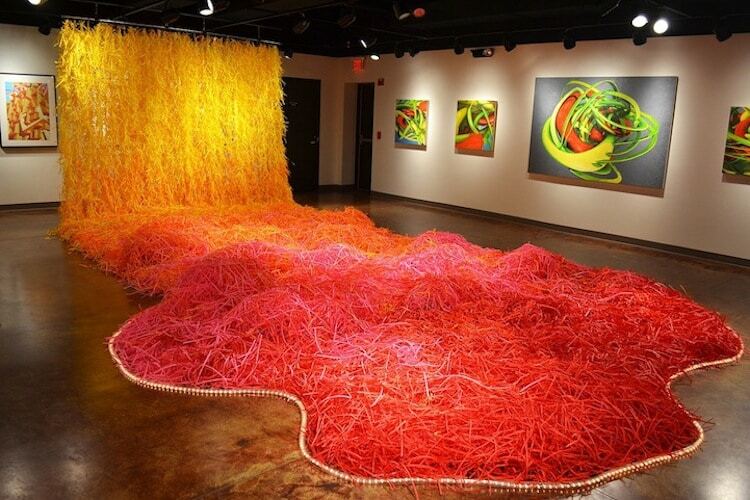 Artist Liz West crafts “vivid environments that mix luminous color and radiant light.” Though her penchant for polychromatic color schemes is apparent in much of her work, she often experiments with mediums and style, culminating in a diverse and original portfolio. 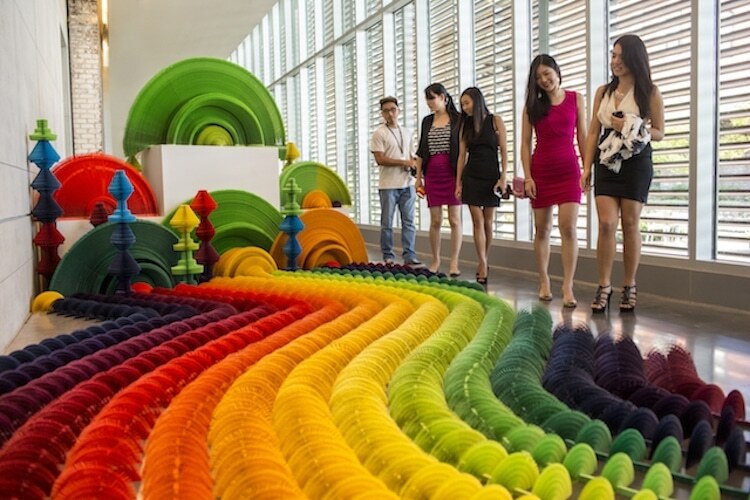 Chinese sculptor Li Hongbo is renowned for his delicate approach to paper art. 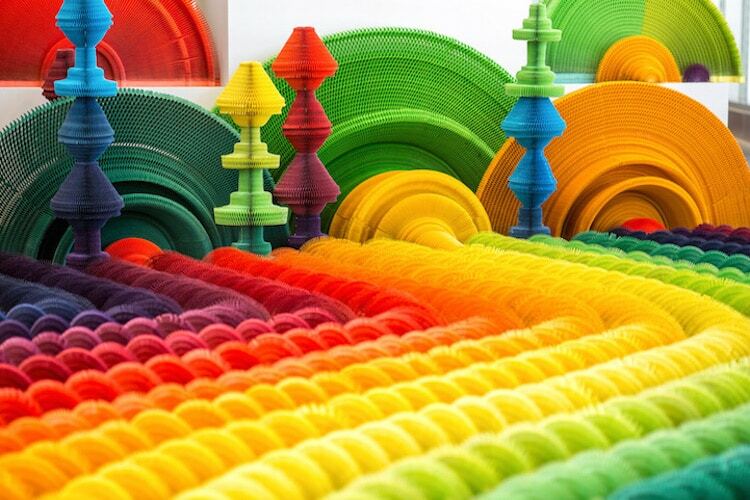 In addition to his celebrated, plain paper busts, Hongbo has also created Irons for the Ages, Flowers for the Day, a radiant rainbow installation that unexpectedly explores the controversial conflict surrounding guns and weapons. 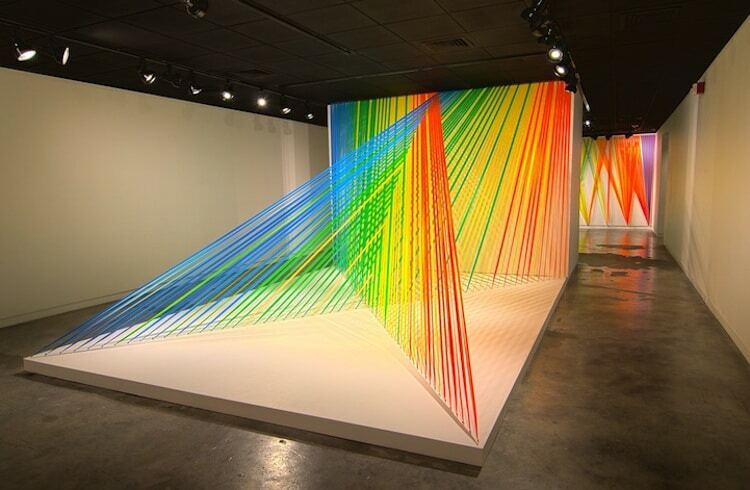 Los Angeles-based artist Megan Geckler employs plastic tape to create kaleidoscopic installations. 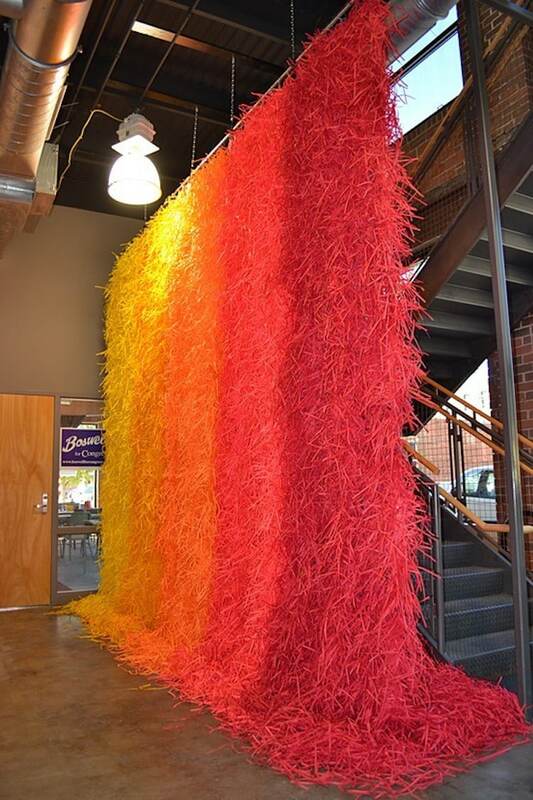 Though industrial in nature, the material is beautiful when banded or woven together. 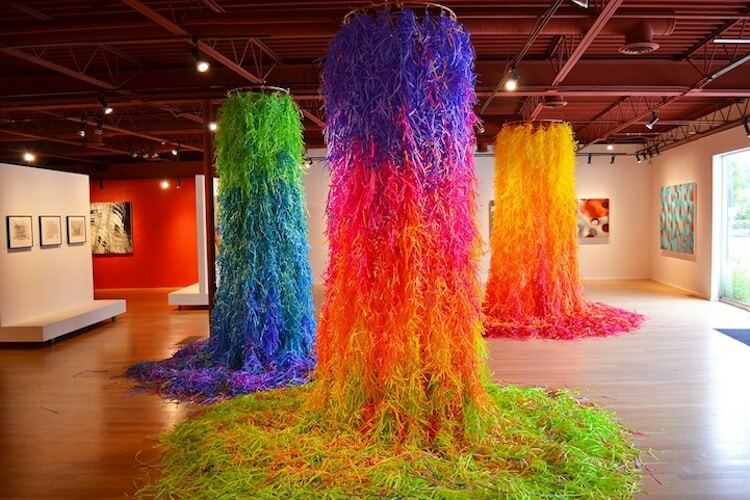 “The tape becomes the surface and a point of departure for color studies, achieved by layering the material over itself, much like a painter would use a glaze, exponentially increasing the limited palette that is available,” she explains. 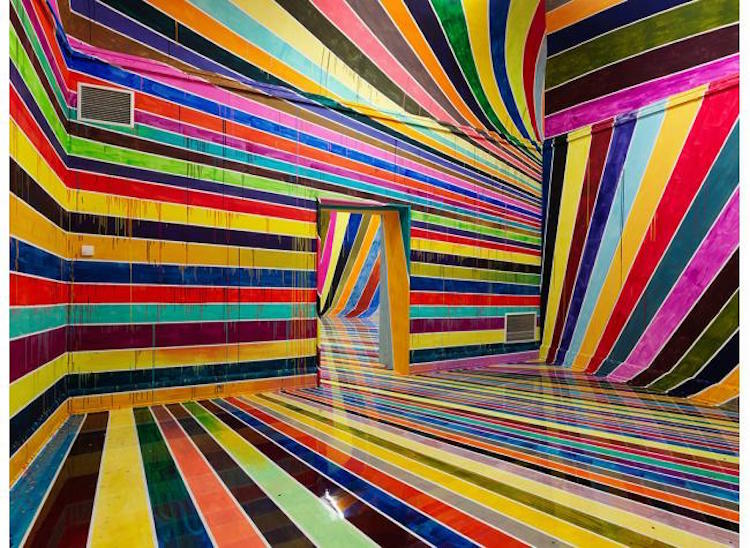 German artist Markus Linnenbrink‘s striped installations transform ordinary spaces into psychedelic experiences. 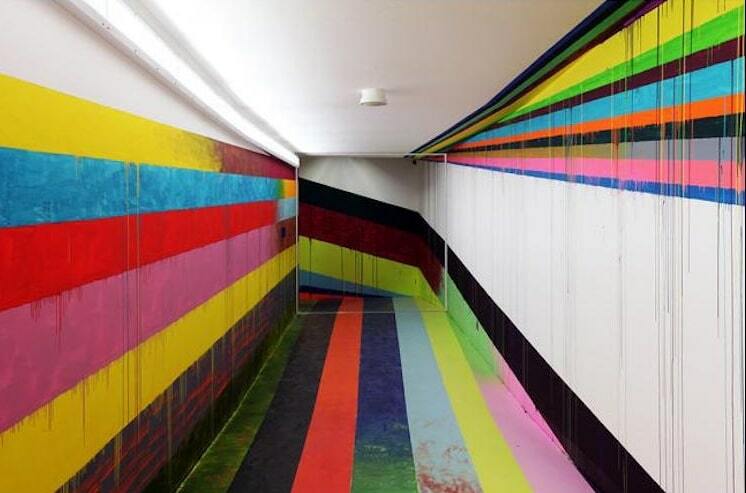 Dripping paint, clashing colors, and perplexing perspectives disorient the viewer and showcase Linnenbrink’s innovative approach to interactive installations. 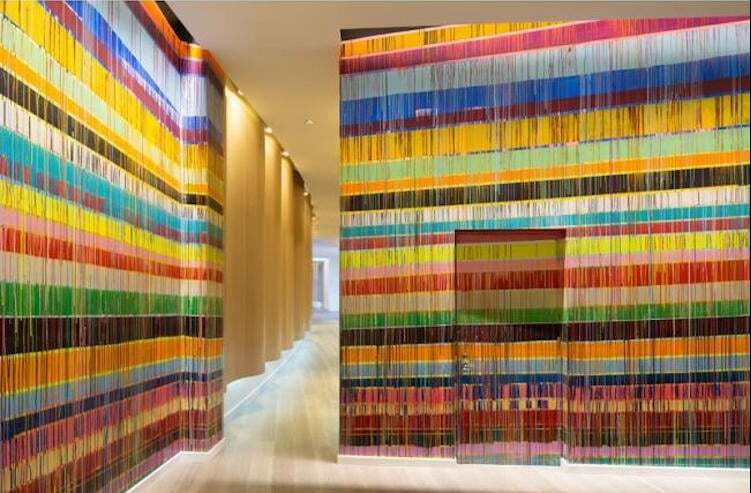 The eclectic oeuvre of Spanish design firm Brut Deluxe conveys an artistic interest in architecture and industrial design. 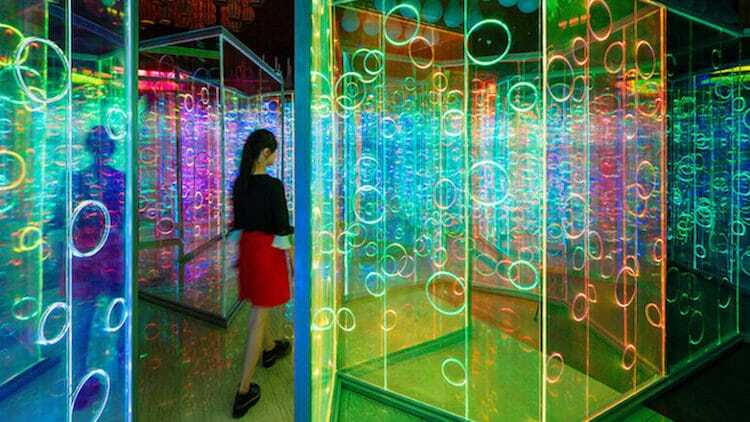 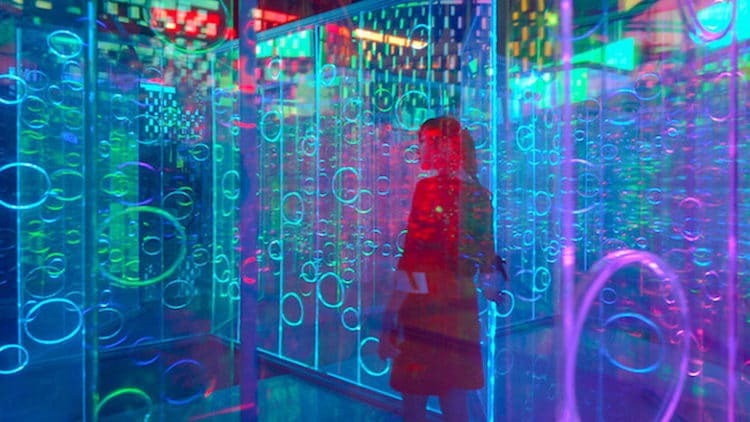 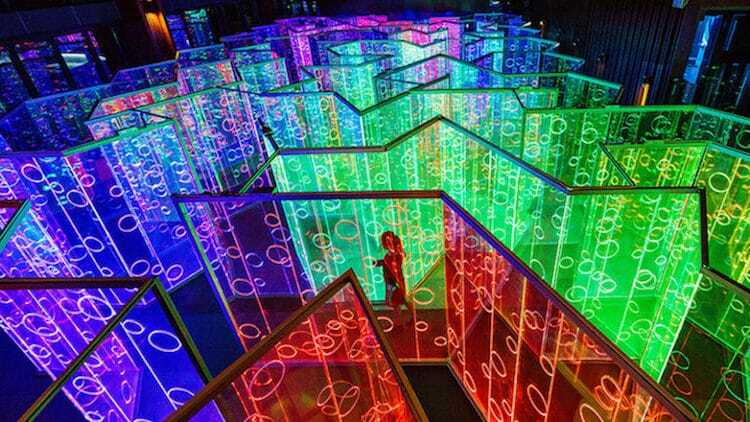 Yǔzhòu, an interactive installation created for the Luneng Sanya Bay Light and Art Festival in China, invites visitors to enter a labyrinth-like environment composed of dazzling multicolored lights. 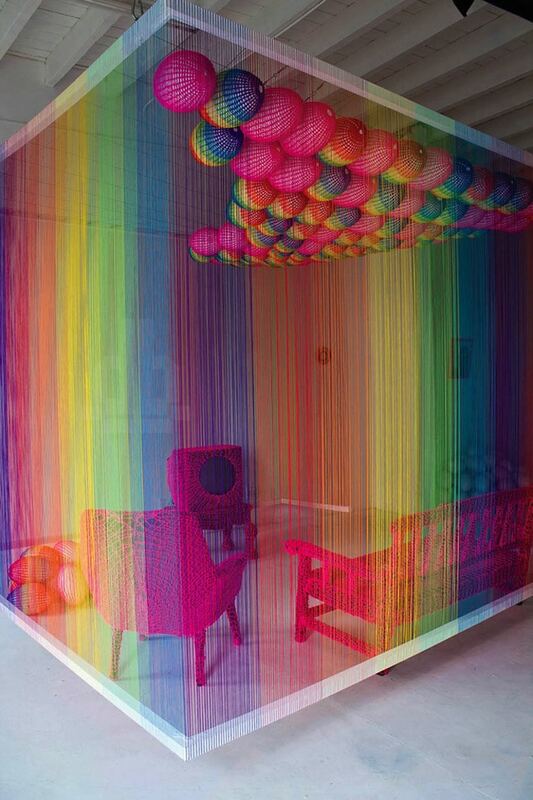 The colorful art of Pierre Le Riche captures the Cape Town-based designer’s interest in exploring the social issues that surround homosexuality. 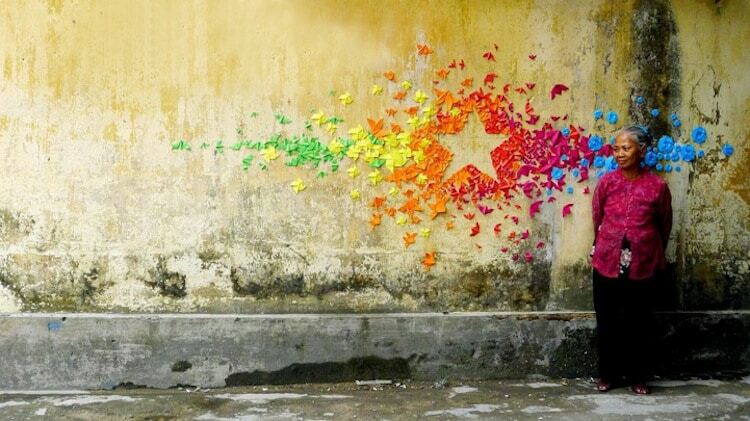 With the gay flag as his muse, Le Riche creates rainbow works that are as conceptual as they are aesthetically fascinating. 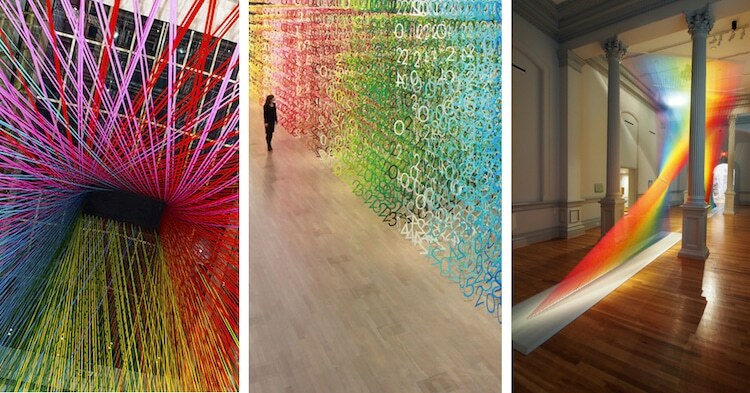 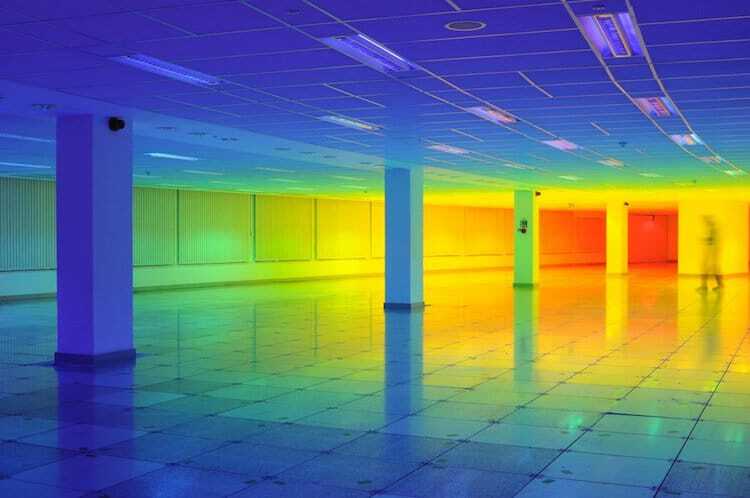 The post 10 Avant-Garde Artists Whose Rainbow Art Installations Will Mesmerize You appeared first on My Modern Met.